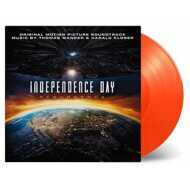 180 Gram Audiophile Orange Vinyl Edition! After two decades there's finally the sequel to the blockbuster hit of 1996's Independence Day. Music score is composed by Thomas Wander, who has won BMI Film Music Awards in 2008 for his score in 10,000 BC, in 2010 for his score in the movie 2012 and in 2014 for the score to White House Down, and Harold Kloser. Also featured are great tracks by Kid Bloom performing "Electric U" and the excellent cover of "Bang Bang (My Baby Shot Me Down)" performed by Annie Trousseau originally recorded by Cher in 1966.